This drawing, by Dutch painterFrans Post (1612-1680), depicts a giant anteater. In 1637-1644, Post was in northeast Brazil, then part of the Dutch colonial empire. He painted local landscapes. 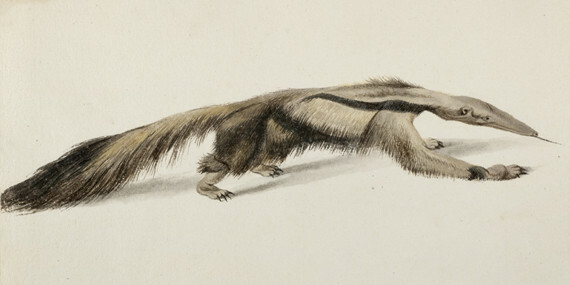 And he also made 34 drawings of Brazilian animals; these drawings were only recently found again. From 7 October 2016 till 8 January 2017, there will be in the Rijksmuseum in Amsterdam in the Netherlands an exhibition showing these drawings, paintings and stuffed animals of the depicted species from the collection of Naturalis museum in Leiden. Some of the animal species depicted by Post can also be seen alive in Artis zoo in Amsterdam. On 7 October, a drawing contest will start of depictions of these animals by zoo visitors.